PSNI Global Alliance, the largest network of audiovisual integrators and service providers in the world is pleased to award Viewhaus Sistemas, located in Guadalajara, Mexico and Level 3 Audiovisual, headquartered in Mesa, Arizona, the “Best Places to Work in AV” award for 2018. This award recognizes members of PSNI Global Alliance who exceed key employee-performance metrics identified by the PSNI-exclusive Employee Engagement Survey. 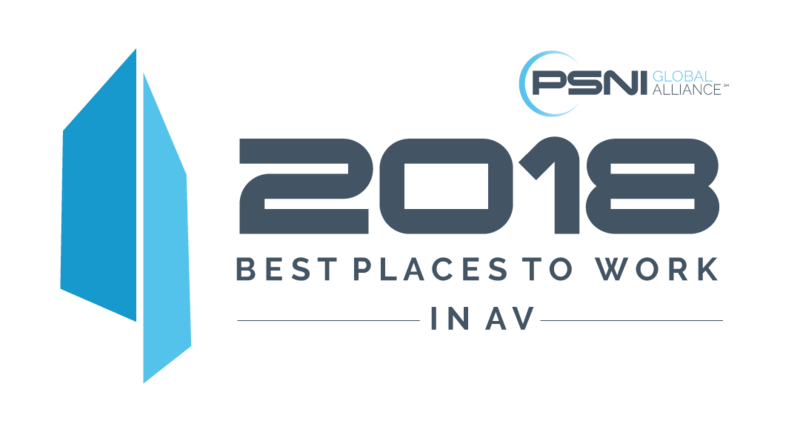 Based on an analysis completed by an independent research firm, PSNI Global Alliance awarded Level 3 Audiovisual “‘The Best Place to Work in AV’ with over 50 employees” while Viewhaus Sistemas was the recipient of “’The Best Place to Work in AV’ with under 50 employees” award for 2018. The survey asks respondents to identify their trust in leadership, organizational culture, ownership of job responsibilities, potential for achievement, effective communication and the hiring of like-minded employees that fit within the organization. Amongst other information, the survey found that overall, 85% of employees at PSNI Global Alliance-affiliated companies are satisfied with their employment and 94% of employees like the type of work they do for their employer. PSNI Global Alliance is a firm advocate of employee engagement and employee development. The Employee Engagement survey is one of many key performance indicators (KPIs) the network has in place to maintain membership within the alliance. Since 2014, over 9000 PSNI member employee responses have been recorded and today remains the only survey of its kind in for the AV industry. For more information on PSNI if you are interested in becoming a PSNI Global Alliance member, please contact Chris Miller at cmiller@psni.org.